ROSE is not a 4 Letter Dirty Word And THEY ARE NOT SWEET WHITE ZINFANDEL!! Sad to say but Americans need to get out of their stubborn state of being creatures of habits and step out of the box. I reside in South Florida and I can’t think of one better wine to drink in this Jungle Weather we have here for 5-6 months than ROSES. I also can’t think of one style of wine that is the most food versatile wine in the world than ROSES…HOWEVER and I repeat HOWEVER, they are the most difficult wines to sell because Americans have their minds made up that Roses are all SUGAR WATER WHITE ZINFANDEL. They are far from that. All wines start off as WHITE GRAPE JUICE. It is the Pigments of the Red Skins that turn the white juice from pink and if macerated long enough into a Red Wine like Cabernet Sauvignon, Pinot Noir, Merlot etc. Each of those wines just mentioned could be made into a lighter, more refreshing style of wine if they only left the skins in the ferment tanks for a little while, into a ROSE of Cabernet, Merlot or Pinot Noir. I never thought I would thank a celebrity for getting involved in the Wine Business because most of them are just using their name and not really hands on but ….THANK YOU THANK YOU THANK YOU BRAD PITT and ANGELINA JOLIE. They wouldn’t Listen to me or any other Sommelier but now you have the most popular sought after Rose in America. 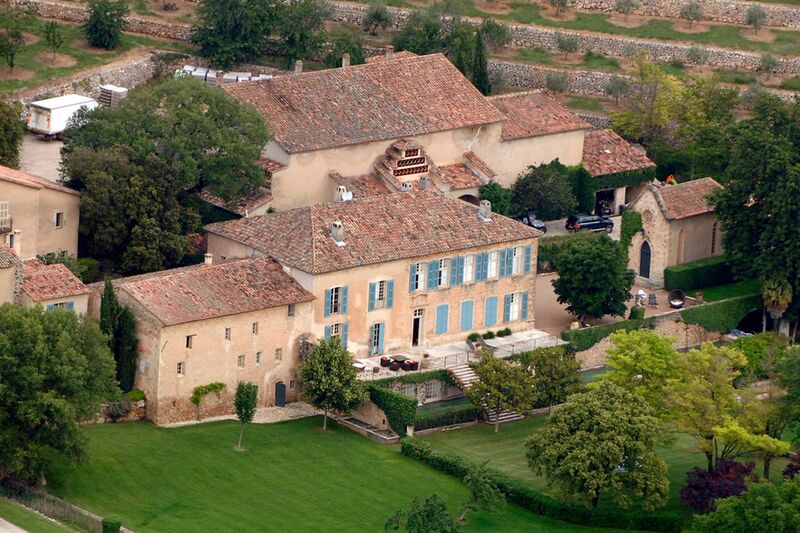 Chateau Miraval has been around forever in the south of France. Brad Pitt and Angelina Jolie have wanted to own a vineyard for many years even though their schedules you would think were too busy to make wine but they bought this beautiful property shown here below. Ok, maybe after a few days in the vineyard they thought they might want to reach out for some help to teach them. Who better in that part of the world than the PERRIN Family of Chateau Du Beaucastel in Chateauneuf Du Pape and The Southern Rhone. Mark Perrin looked at the property and the future potential of wines made from grapes that could be planted and over a glass of ROSE they Sealed the Deal and Pitt-Jolie-Perrin are now 50% equal partners in this project since 2008. The 2012 release Rose comprised of Grenache, Syrah, Cinsault and Rolle (Vermentino in Italy) put the project on the Map when it was selected as the #84 wine of the year on Wine Spectator’s Top 100 Wines of 2013. I just sampled the 2013 Release of Chateau Miraval Rose which has already scored 91 Points by Decanter Magazine and 90 Points by Robert Parker and it was, floral, wild strawberries and vanilla on the nose and great acidity and refreshing minerality on the mid palate. I’ve had a dry rose from Clos LaChance, which I liked very much. I don’t care for sweet wines any more (drank white zin in my 20’s). Are most roses dry? I’d like to try more, but I don’t want to end up with something sweet by mistake. I’m not new to wine, but I’m try to learn more about it and make educated decisions when purchasing. I love red wines… especially zinfandel and Shiraz. Have you ever tried Black Forest by Cupcake vineyards? So delicious! I’m taking your advice about avoiding California wines and trying more Washington, French, Italian and Spanish wines. Drank a Spanish red last night and it didn’t give me reflux up the wazoo like that KJ Chardonnay did. I dumped the rest of that KJ down the sink! Also paying close attention to alcohol content based on your past posts. I’m working my way through your articles and will go back through to note your specific recommendations (if they’re within my budget ☺). Previous2012 OREGON PINOT….THE NEAR PERFECT VINTAGE ! NextWas I California Dreaming Or Did I Have Lunch With Stephanie Honig? ?